The camera pans across the galaxy, floats past several planets on its way to Earth’s moon. We see a princess and a prince running towards each other and smiling. Now. Tokyo, Japan. Azabu Juban. 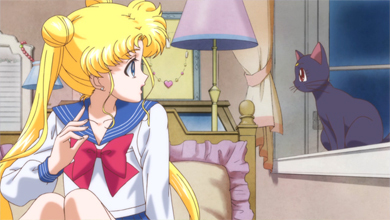 A girl named, Usagi is woken up by her alarm and hurries to get dressed for school. As she runs down the stairs, she trips and falls. 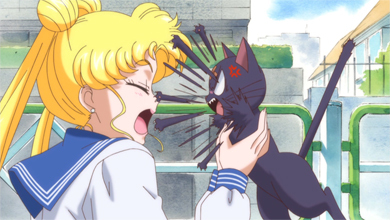 Her mother asks her if she’s fine and Usagi whines that she’s not, grabs her lunch and runs out the front door. On her way to school she accidentally steps on a black cat with two band-aids on its forehead. 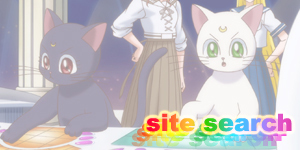 Usagi carefully removes them and is surprised to see a crescent moon mark. Usagi comments on how cute the cat is and leans in to kiss it but the cat scratches her face and jumps out of her hands onto her head then onto a nearby wall. 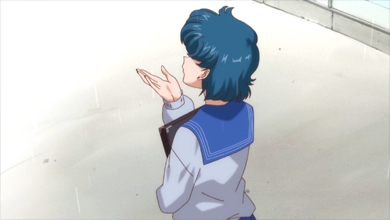 At school, Usagi is forced to stand outside her classroom due to being late. She daydreams about the princess she saw in her dream (the same in the opening sequence) and decides to eat her lunch. Her teacher, Miss Haruna angrily opens the classroom door to see what Usagi is going on about and then shows her that she fails the class test. Later, Usagi talks to her friend Naru about her test results while Umino brags about how easy it was for him. 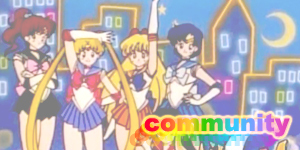 During lunch they talk about a new superhero that’s appeared recently called, Sailor V. Naru then mentions that her mum is having a sale at her jewellery store and the girls decide to go visit after school. When they arrive, Naru mentions how unusual it is for her mum to have such a big sale. Her friends though are too excited by the prospect of cheap jewellery. Usagi eventually leaves. While walking out of the building she looks at her failed test one more time, scrunches it up and throws it over her shoulder. It hits a mysterious man behind her who unfolds the paper and comments on how bad the score is. He then makes eye contact with Usagi and the two seem to share some kind of connection or shared memory. Usagi nervously walks away and wonders why she feels this way about a complete stranger. The man looks at the store and wonders if the Legendary Silver Crystal is there. 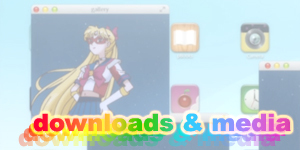 Before going home, Usagi stops by a video game arcade to play the new Sailor V video game. Motoki , one of the staff whom she likes, talks to her and helps her play the game. The black cat from before appears and stares at her. 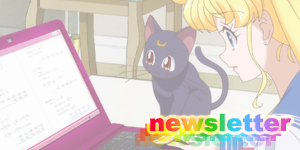 When Usagi gets home, her mother is furious with her test results and kicks her out. Her brother, Shingo teases her before going inside. Usagi tries to kick him but hits the door and begins crying. Back at the jewellery store, Naru’s mother is laughing evilly and talks to herself about how she’s absorbing human energy and looking for a crystal. Naru walks in on her and gasps when she sees her mother’s face which is now monstrous in appearance. In Usagi’s room, Usagi is dreaming that she is a princess and running with a prince. Suddenly the dream changes into a Sailor V video game dream and she’s woken up by the black cat who has snuck into her bedroom through her window and scratched her on the face! The cat begins to talk and explains that her name is Luna and that the band-aids before were blocking her abilities. 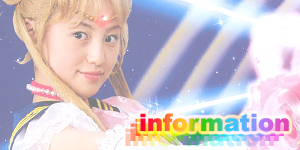 She tells Usagi that she is a Sailor Guardian and gives her a magical brooch. Usagi thinks it’s a dream at first but quickly agrees to go along with the situation if it means getting free jewellery. 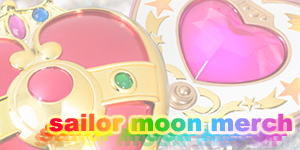 The brooch begins to glow and Luna tells Usagi to say, “Moon Prism Power Make Up”. 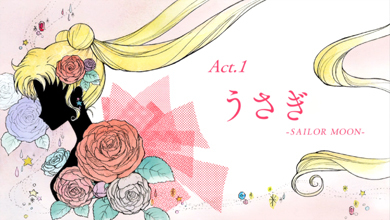 Usagi hesitantly begins to say it though a calm comes over her and she finishes it dramatically. Usagi transforms into Sailor Moon for the first time and immediately she begins to magically hear Naru screaming for help. 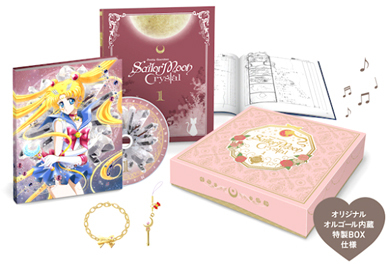 Sailor Moon and Luna race to Naru’s jewellery store and confront the monster that had been imitating her mother. 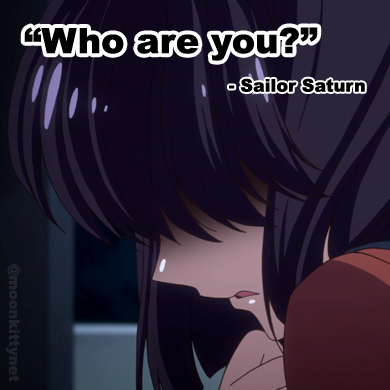 Sailor Moon, beginning to awaken, introduces herself. The monster sends several mind controlled women after her. Sailor Moon screams and activates a sonic wave attack that stuns everyone and shatters all the glass in the room. The mysterious man from before appears, now wearing a mask and cape, and tells Sailor Moon to stand up and believe in herself. 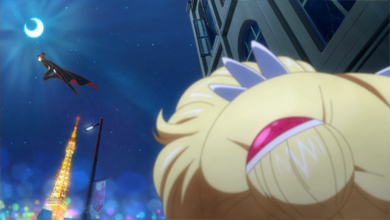 Luna tells Sailor Moon to attack with her tiara and say “Moon Tiara Boomerang”. 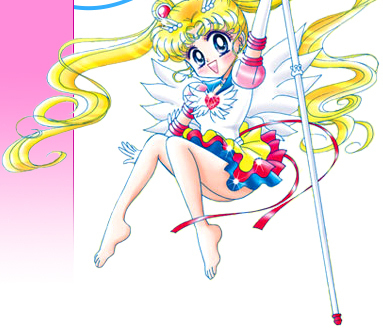 Sailor Moon follows her instructions and attacks with Moon Tiara Boomerang for the first time, defeating the monster. Sailor Moon runs outside to see the man leaping away through the night sky. He tells her that his name is Tuxedo Mask and that he will remember her. Elsewhere, the evil man behind this monster in the jewellery store watches the events through a crystal ball and tells himself that he will find the Legendary Silver Crystal. The next day at school, Naru tells her friends that she passed out when a robber broke into the store but she remembers being saved by a Sailor Guardian when she woke up. Her friends think she was just dreaming. Usagi, standing around the corner with Luna on her shoulder and her new brooch on her chest laments that it wasn’t a dream and was very much real. Outside, a girl with blue hair runs out of the building as it begins to rain. 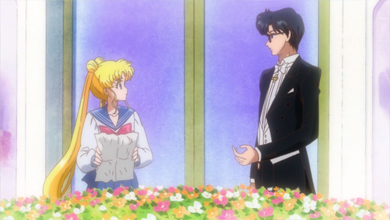 Being the first episode of Pretty Guardian Sailor Moon Crystal, this episode saw the first appearance of a lot of characters such as; Princess Serenity, Prince Endymion, Usagi, Ikuko (Usagi's mum), Shingo, Luna, Mamoru, Jadeite, Naru, Motoki and of course Sailor V (though only in fantasy sequences). 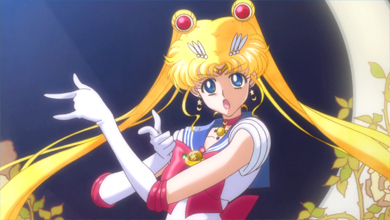 Sailor Moon used her hearing ability, sonic waves attack as well as Moon Tiara Boomerang for the first time in this episode. 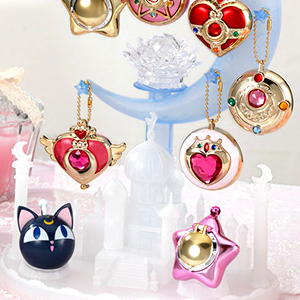 In a blink-and-you'll-miss-it shot, Mamoru can be seen in possession of the Star Locket (also called Carillon or Orgel). 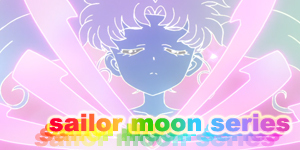 Sailor Moon's first transformation brooch appeared for the first time in this episode. 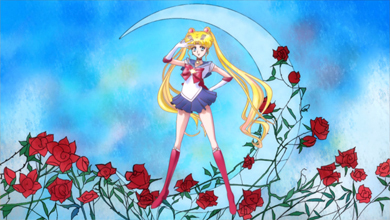 While the majority of the episode is made with traditional 2D animation, Sailor Moon's transformation scene is in fact completely computer generated.